← Deconstructing the lines between skills and GUI interaction? Deconstructing the lines between skills and GUI interaction? McCullough brings a challenging and thought-provoking discussion of the line (be it defined or rather blurry) between 1.) skills, connected strongly to the hands, sharpened only by practice, and 2.) the simplified, “spoonfed” use of computers and their mice, keyboards and screens. To me, the most interesting complications with McCullough’s efforts to explain fundamental differences between the two lie in the ambiguities. Where does the line between manual skills and mind-driven computer interaction become less relevant, or less obvious? In the example of the “computer graphics artisan,” the fact that this person’s eye is not on their hand, as it makes small and fast movements with the mouse or the keyboard, but instead on the screen, is the distinguishing factor. Sure, it is clear that the graphical and two dimensional feedback delivered by a computer screen is different than the textural feedback and sensual expertise developed by a sculptor or a painter. But what about the times when the graphical and sensual feedbacks are integrated in a symbiotic fashion? A skill (that is most definitely a skill of both the hands and the body in the ways that McCullough has defined) that is near and dear to me is that of rowing a scull. Just as much an endeavor in art as in sport, my rowing experience (both coaching and as an athlete) came to mind. The rower, similarly to the piano player, cannot have the luxury of using his or her mind in full to complete the actions of the stroke (or the keystrokes). Over the course of a stroke, there are simply too many fine details in the movements, pressures and feelings in the fingertips and the soles of the feet, to be conscious of every action at once. As a result, much of the stroke must be committed to muscle memory, and based on sensation rather than cognition. The art and skill of crew begins to creep across the line that McCullough drew when we add some of the newer technologies in the sport. For instance, modern rowing machines have instant feedback via GUI that provide graphs of the rower’s “power curve” over the course of a stroke. The shape, size, and duration of this curve can be used as a graphical representation of the feel-based skills of the rower. 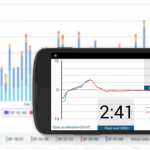 Even more recently, technologies like Rowing in Motion https://www.rowinginmotion.com/ have begun to bring this sort of graphical instant feedback from the machine to the water. 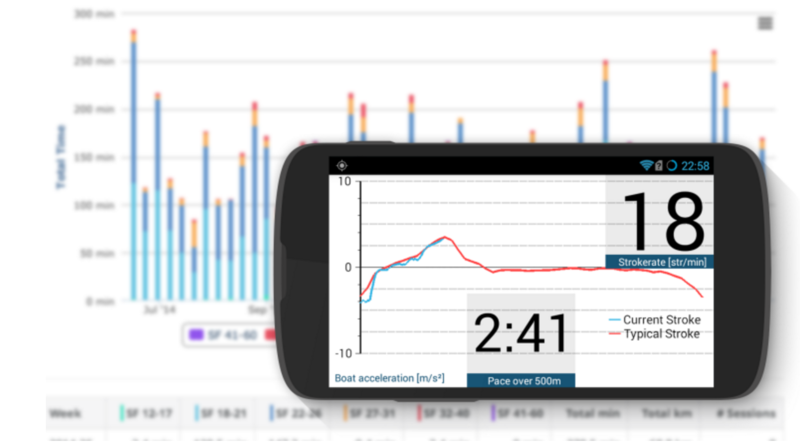 The RiM app, for Android and iOS, uses a rower’s phone in the boat with them and diagnoses not just a power curve, but also other quantifications like check factor (a measure of how quickly the rower changes direction from moving their body toward the stern, away from the finish line, to beginning to apply force to the bladeface), and an acceleration curve, all delivered to the phone screen in real time. In this case, the mind-oriented and the skill-based work together to improve each other. The rower can more effectively self-diagnose ways to improve his or her skills, and also use the digital feedback to better distinguish the sensations of habits that add to boat speed from those that would take away from it.